Preheat oven to 375 degrees. Saute vegetables in a pan with a small amount of olive oil. When vegetables are soft, add chopped spinach and stir until wilted. Remove vegetables from heat and allow to cool a bit. In a large mixing bowl, place 2 pounds of lean ground chicken. Season with 1/2 teaspoon each of salt, pepper, and garlic powder. Add ketchup, mustard, Worcestershire sauce, and rice cracker crumbs. Add vegetables and gently mix everything together using your hands or a potato masher. 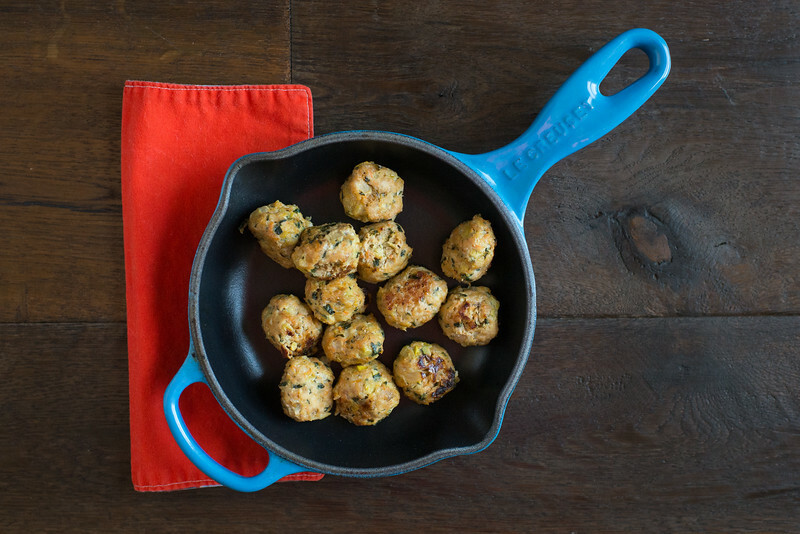 Using a small scoop, form meatballs and place on a baking sheet sprayed with non-stick spray. Bake meatballs for 15 minutes, then turn them and bake for an additional 15 minutes. Add to your favorite sauce or eat plain. They also taste great cold and can easily be packed for lunch. Meatballs can be a great food for new eaters. the soft consistency of the veggies and meat make it easy to swallow as you introduce texture. For brand new eaters who are still learning a smooth texture, use a little low sodium broth to puree the meatball into a softer consistency. For more advanced eaters, break off small pieces or make teeny tiny meatballs to practice self-feeding and perfect the pincer grasp.